Tsubasa Reservoir Chronicle Wallpaper: . : Bloody Queen :. 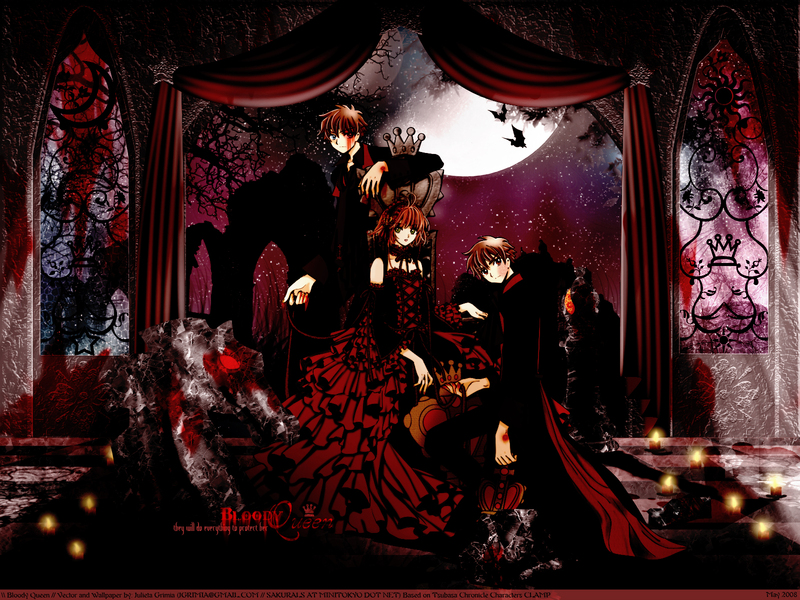 Minitokyo »	Tsubasa Reservoir Chronicle Wallpapers » Tsubasa Reservoir Chronicle Wallpaper: . : Bloody Queen :. This is my entry for the Tsubasa's Group Wallpaper Contest 2008 and Dark-Wallies's Group Wallpaper Contest too! Let's talk about it... as you can see.. i change Sakura and the Syaoran's colors, from white to red, and also i change Sakura's symbol which was the same as the syaoran's one in the original scans.. i do this because i think the symbol was for the King in the chess and not for the Queen. But this things are more good looking in the vector. The wallpaper is called "Bloody Queen" because Sakura is the Queen of the Cheess, and she had two kings that destroy everything that wants to hurt their Queen and splatered blood in everyplace of the picture. For this wallpaper i made everything from shaped vectors based in my imagination (in exception of the Tsubasa image of course) So, the background, the chess pieces, the curtain, the windows, everything was made by me using shaped vectors and textures. The only brushes here are the moon, the buildings at the back, the grass and the plants. Is a bloody wallie :P hahahaha! As I already said at MSN, this wallie is gorgeous, amazing beyond words. The vector is so nice and clean, not to mention all these details you put into the wallie with all your effort. The windows and its frames, the shadows they throw onto the ground, the blood everywhere, the trees, even the bats. The best part of the background is the sky though. I loooooooooooooooooooooooooooove it. It belongs to the kind of dark night skies which really appeal to me. Awesome job, very well done. Will be my new desktop bg. just perfect! the dark mood the red color...just awesome! the vector is very well the lines are smooth and thin! can't say more...have no words.. >.< perfect! Great wall. Looks awesome. I like the added chess piece (not a rook, what's it called?) and the moon on one side with the sun on the other. The textures look beautiful: silky curtains and gritty castle walls... Excellent job. I was curious what the picture in the background was. The black mound with the person standing on top! That's so freak'n awesome. Fave from me! Nice vectoring and of cux a nice wall but i personally find that the textures were kinda over used in some areas of the wall making it slight hard to tell the difference. I like colours and beautiful background. It's been a while since the last time a saw a wallpaper as wonderfull as this one. Your work on the textures, background, characters and colours made the final product look incredible, and it's a real pleasure and delight to see this finished :D I luv it! Thanks for sharing this ith us :). Sorry if I sound like a storm cloud, but I kind of feel like there's way too much going on with the wallpaper, and that it buries the beautiful vector underneath. I really like all of the individual things that you put into this wallpaper, I just feel that together it has become overcrowded and smothers the main characters. The vector looks jagged in several places as well (most noticeably around the hair), which is kinda strange since this is smaller than the original vector, and that didn't look quite so pixelated in the larger format (maybe it's because of how you saved it?). o_0 But I have to say, I love the way you did the text. Mixing the different fonts was an excellent move, and the placement is fitting. It's great to see people using text effectively in wallpapers :D It's too much for me personally as an entire wallpaper, but the individuals elements are nice on their own. Awesome, awesome, awesome!<3 You're great! I love this wallpaper so much! I love the background and the blood!